"Discovered picking pockets at Coxford's Corn Market, fourteen year old Sin is hunted across the city. Caught by the enigmatic Eldritch Moons, Sin is offered a way out of his life of crime: join the Covert Operations Group (COG) and train to become a spy. At Lenheim Palace, Sin l... read full description below. Discovered picking pockets at Coxford's Corn Market, fourteen year old Sin is hunted across the city. Caught by the enigmatic Eldritch Moons, Sin is offered a way out of his life of crime: join the Covert Operations Group (COG) and train to become a spy. At Lenheim Palace, Sin learns spy craft while trying not to break the school's Cast-Iron Rules. Befriended by eccentric Zonda Chubb, together they endeavour to unmask a traitor causing havoc within the palace. After an assassination attempt on the founder of COG, Sin realises that someone closest to him could be the traitor. With no other option, Sin is forced into an uneasy alliance with the school bully, Velvet Von Darque. But can he trust her? And will COG try to bury him with the secrets he discovers? Secrets, spies and steampunk gadgets abound in this fantastic adventure story! Gareth Ward (aka The Great Wardini) is a magician, hypnotist, storyteller and bookseller. He has worked as a Royal Marine Commando, police officer, evil magician and zombie, and as a writer and compere of Napier City's inaugural steampunk murder mystery evening. Born near Oxford in the UK he currently lives in Hawke's Bay, New Zealand, where he runs two independent bookshops with his wife Louise. 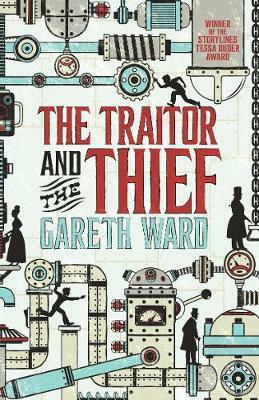 His first novel The Traitor and the Thief, a rip-roaring steampunk adventure, won the 2016 Storylines Tessa Duder Award.